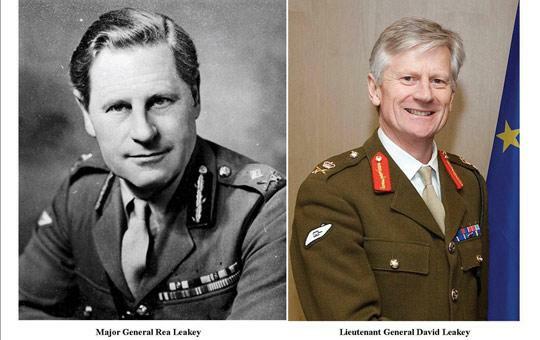 Lieutenant General David Leakey (right) and his father Major General Rea Leakey. The director general of the European Union Military Staff ends a three-day stay in Malta today at the invitation of the Armed Forces of Malta. Lieutenant General David Leakey, 57, fondly recalled his teenage years on the island when his father, Major General Rea Leakey, served here between February and November 1967. Throughout his visit, Mr Leakey had the opportunity to see his father's uniform, which he gave to the Royal Malta Artillery before he left and was formerly displayed at the War Museum. Lt Gen. Leakey also followed a series of demonstrations at Lyster Barracks in Ħal Far.